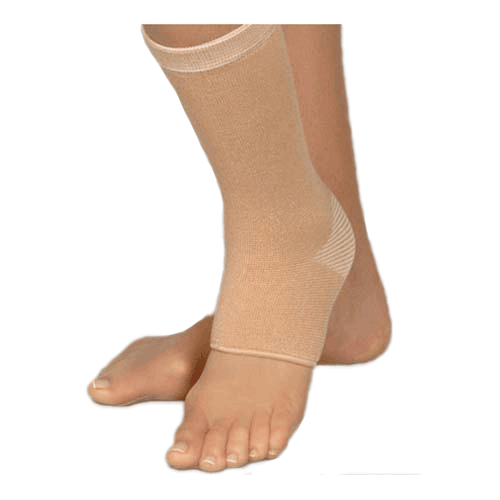 Joint Warming Ankle Support, manufactured by Therall, is a comfortable ankle brace with heat therapy. You may select the Joint Warming Ankle Support to help alleviate pain from arthritis, mild strains, or overuse of the joint. The Joint Warming Ankle Support features ceramic fibers inside the brace. The ceramic fibers insulate the affected area by retaining heat and slowly emitting it back into the joint and surrounding tissues. This process results in a therapeutic heat therapy that delivers soothing relief. The material stretches four different directions which allows light compression and counteracts swelling. In addition, this brace will increase blood circulation in the affected area. Joint mobility will also increase, too, which will allow you to return quickly to your normal daily routines. For increased relief from arthritis, you should look in to using acetaminophen in conjunction with the Joint Warming Ankle Support. Please see chart to find which size will work best for you. Measure the circumference around your elbow. 53-9024 S 6.25 - 8.25"
53-9025 M 8.25 - 10.25"
53-9026 L 10.25 - 12.25"
53-9027 XL 12.25 - 15.5"
53-9027 XXL 15.5 - 17"
Product Numbers: 53-9024, 53-9025, 53-9026, 53-9027, 53-9028. Application: Provides relief to ankle and surrounding tissues.